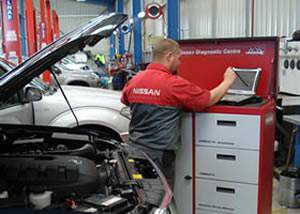 At Southern Vales Nissan, our workshop utilises the most up to date equipment and has been purpose built to support the Nissan maintenance program, which allows you to get the best performance from your Nissan vehicle. Southern Vales Nissan has a solid reputation in the automobile industry, maintaining the highest customer satisfaction rating possible and is dedicated to maintain this reputation. Giving you the customer 100% satisfaction guaranteed. In fact, Southern Vales Nissan have previously been rated as a Nissan Platinum Dealership, an accolade achieved by select Nissan Dealerships across Australia. Southern Vales Nissan offer Monday to Friday servicing between 7.30am and 5.30pm. Saturday services are available between 8am and 12 noon. Naturally we offer loan cars while your car is being serviced, at a small fee and providing bookings are made in advance. Or services can be done while you wait in our customer lounge with a free tee or coffee and watch TV. The Southern Vales Nissan team wishes you safe and pleasant motoring.